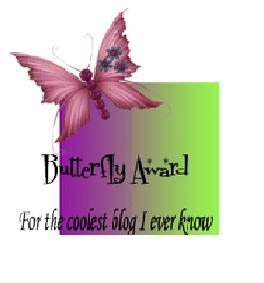 This is my first blog award!!! What a great award to receive as my first the Butterfly Award! I love butterflies lol.. I am so honored to be one of the nominees for this award.. i never thought I would receive any of these blog awards, so thank you so much Chrissy @ Nail Utopia. If you are not following her yet.. you should! She is an awesome nail blogger. 1) Link back to the person who awarded you. 2) Answer the following questions. 3) Award other bloggers and let them know. 1) What's your favorite song? Mariah Carey Hero is my all time favorite song & artist. 2) What's your favorite dessert? 3) What's your favorite pet? I don't have one.. I had turtles before though..
5) What's your biggest fear? 6) What's your best feature? 7) What's your everyday attitude? Thank you for nominating me! I will try to post about this award when I have some free time.